Alejandro Rettig y Martinez on a recent trip to Toledo, Spain. 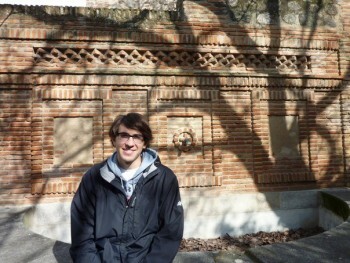 Alejandro Rettig y Martinez '12 is using his IES scholarship to help fund a semester studying in Salamanca, Spain. A merit-based scholarship from study abroad consortium IES Abroad is helping Alejandro Rettig y Martinez '12 further his studies in Salamanca, Spain, this semester. He is one of 74 students chosen to receive funding from the organization for the spring 2011 semester. IES Abroad is a Chicago-based non-profit that offers study abroad programs to more than 5500 U.S.-based college students each year. Those students participate in 100 programs in 32 locations around the globe. This year, IES Abroad has committed $2.3 million in financial aid for students, including $105,000 in merit-based scholarships for the spring 2011 semester, which includes the one Rettig y Martinez won.“It has allowed me to worry a little bit less about the financial side of study abroad,” he says.